To enable CloVR’s shared folders in VMware Player, click on the “Player” button under the VM window’s title bar and select the “Shared Folders” option. Please note that “Always enabled” refers to the current VM session. If you shutdown your VMware Player or your computer, you may need to do this the next time you use CloVR. Now that shared folders are enabled, you’ll need to correct the Host Path for each shared folder. 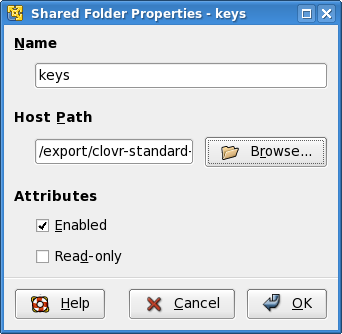 As shown in the screenshot above, select one folder and click the “Properties” button. Make sure that the “Enabled” box is checked under Attributes and click “Browse” under Host Path. 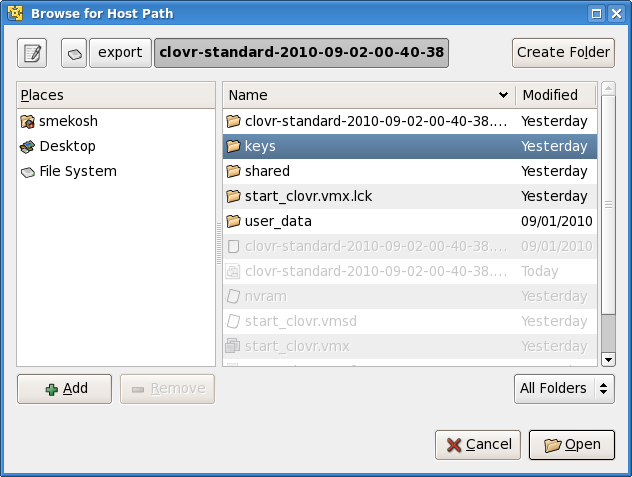 Use the Browse for Host Path window to find each folder within the unpacked CloVR image that matches the shared folder name. Click “Open” when the correct folder is highlighted. Click “OK” on the Shared Folder Properties box. Repeat this step for each shared folder.